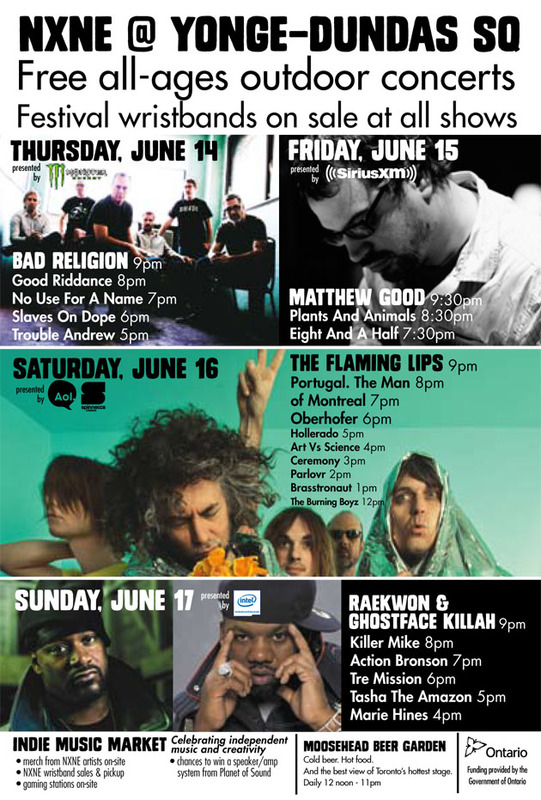 Music Psychos: NXNE Day#4 June 14th, thursday! NXNE Day#4 June 14th, thursday! I hope you guys enjoyed the first night of NXNE madness! But it is just the beginning. From today, there will be more free shows across the city, including the free outdoor shows at Yonge and Dundas Square. This is where I will be for the most of the day today for my day job. Here are some of my recommendations for today. Keep partying everyone! Toronto rock band, the Archives are playing a late night set, but you don't want to miss it. The strong core rythems by the drummer, Kevin Cardenas, rolled up in the air and crafted sonic waves. Supported by such mighty beats,Will Gooch and Crispin Day joined it with playful guitar riffs. Coated on top of that were Anthony Menecola's sweaty screams. A 2p.m show doesn't seem too bad during NXNE, right? What a treat, isn't it? Army girls are playing again tonight at a different venue. Toronto pop duo, Army Girls will entertain you with solid guitar jamming and pulsing drumbeats, impeccably with Carmen Elle's vigour and aesthetic voice. Nova Scotia singer songwriter, Ben Caplan just returned from a two month European tour and this is the first Canadian show since April. It's so sad to miss his show tonight, but you'd better be there. He will blow your mind away with his gypsy voice and outstanding stage performance. Nashville girls frock band, The Black Belles are finally here in Toronto. Many of you may know that this psychedelic girls outfit has been signed up with Jack White's label, Third Man Records and are produced by White himself. They've alsoperformed as a back band for Stephen Colbert. Their 60's garage rock and goth style are definitely reminiscent of White Stripes and Dead Weather. Be ready to indulge in their cult look and Jack White infused Rock N Roll style? Toronto hardrock band, Crooked Valentine is ready to rock you out. The front woman, Lindsey Valentine will mesmerize the audience with her killer look and energetic performance on the stage, which are irresistible. Toronto-based pop band from Nova Scotia, the Danger Bees. I've already listened to their single from the debut album, 'Good Year' 5-6 times on repeat. The infectious melodic hook of the chorus is the ingredient for stuck tune syndrome. Montreal based young electro pop band, Doldrums are back in Toronto for NXNE. Their multiple drumbeats electrify the audience to dance, dance and dance! If you want to start off partying, this is where you should be. It's going to be a busy one. Keep hydrated and party tonight!